7. Will You Survive Prison? Perez Hilton is an American blogger, columnist, and television personality. His blog, PerezHilton.com is known for posts covering gossip items about celebrities. He is also known for posting tabloid photographs over which he has added his own captions or "doodles". Brandon Cole "Bam" Margera is an American professional skateboarder, stunt performer, filmmaker, musician, and television personality. He came to prominence after appearing as a main cast member in MTV's Jackass. He has since appeared on MTV's Viva La Bam and Bam's Unholy Union, all three Jackass movies, and Haggard: The Movie and Minghags: The Movie, both of which he co-wrote and directed. Tyler Deron Lockett is an American football wide receiver and return specialist for the Seattle Seahawks of the National Football League. He was drafted by the Seahawks in the third round of the 2015 NFL Draft. He played college football at Kansas State. Vic Mensa, is an American rapper, singer, songwriter and record producer from Chicago, Illinois. He is currently signed to Roc Nation. Mensa was a member of the group Kids These Days, which broke up in May 2013, after which he released his debut solo mixtape Innanetape. He's an activist and philanthropist. Kristen Melissa Ledlow is an American sports anchor. She currently works for NBA TV as the host of NBA Inside Stuff She has also served as a sports anchor for HLN and CNN. "Andrew congrats on the book launch, SiriusXM and Entrepreneur shows. This is your year, let's get it!" "The funniest book I've read since I wrote my own. Seriously, it's that f-cking good!" 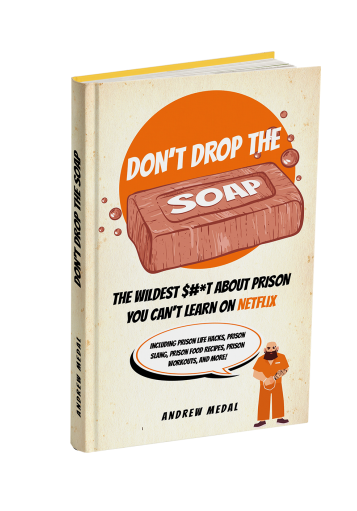 I wrote this book so you could stop watching all those reruns of Orange is the New Black and Lockup Raw. Sign-up to receive the notification when the book is available on Amazon!